Books from the shelves on my studio and desk top. Last week, two of my students were discussing a website which features the studios / offices / workshops and desks of various creative people. 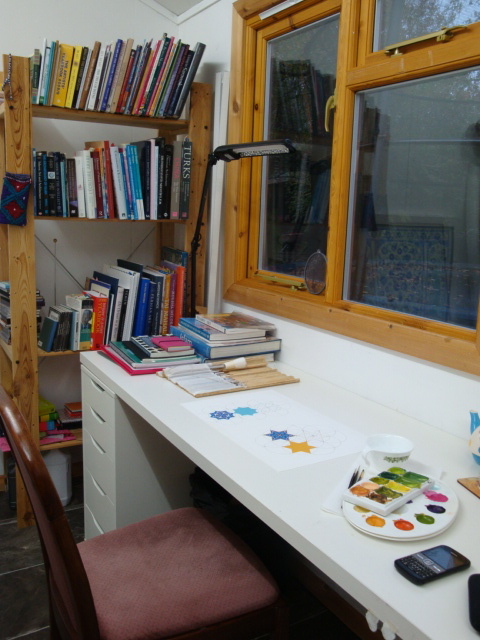 I am always fascinated to see other artist’s studios and sketchbooks. It gives me a real feel for their personality, and helps me to understand how they work. More often than not, it also inspires me to try something different – either in my approach to my work, or in the organisation of my space. The website got us thinking about our own workspaces, and what they might reveal about us. Soon enough, we were all sharing photos of our desk tops and discussing what they might say about each of us – chaotic? organised? elegant? a perfectionist? homely? clinical? creative? scatter-brained? daydreamy? methodical? 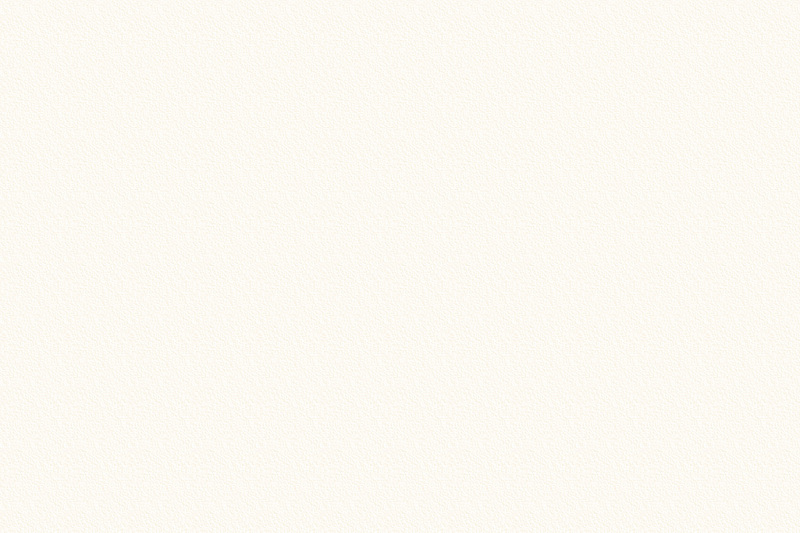 Our discussion gave me the idea for this blog post. 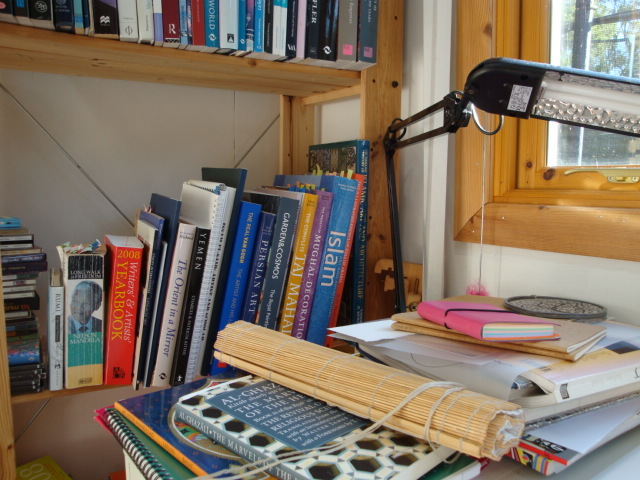 So… in the photo above we have my desk and shelves – this is where most of my work takes place. I purposefully bought a desk with quite a long worktop because I’m often working on several projects at the same time. I am currently dividing my working week (often weekends too!) between being a PhD student, teaching art classes and illustrating a children’s book. In one day I can flip between planning lessons and designing worksheets for my students, to working on the cover art for the book that I’m illustrating, to reading and taking notes on Al-Ghazali as part of my PhD research. Having plenty of space just makes it easier to have many things on the go at one time. A lot of my work is very tiny and delicate, so good lighting is important, hence the desk lamp and position by the window. I also have daylight simulation bulbs in my lights – great for these short winter days when it gets dark at 4pm! I try to keep my desk pretty neat because it helps me to think clearly and be more efficient. However, it can get chaotic at times, but I don’t mind that too much. Usually when that happens it’s because I’m experimenting with lots of different ideas, and that’s a positive thing. I’ll always tidy it again afterwards. As you can probably tell from my palettes, I love colour! I also love my tea… especially when it’s in a pretty cup! 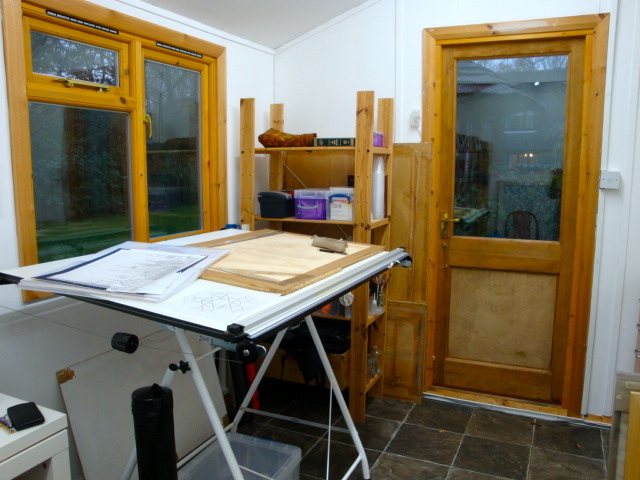 My drawing board - a space for large artwork. My drawing board is a space for working on larger pieces of artwork. 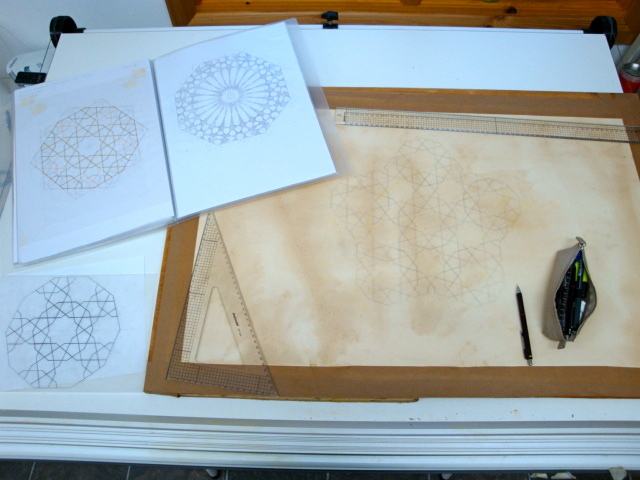 At the moment, it’s home to a geometric painting that I’m working on as part of my PhD research. It’s also by a window so that I can gain from the good light. Behind it is a shelf full of various painting and drawing equipment. Some of my larger work on the drawing board. I am planning on writing a blog post about this work-in-progress at a later date. I’ve used hot-pressed watercolour paper (Fabriano, I think?) and I’ve put a tea-stain over the top – see, told you I like my tea! I’ve made several attempts at constructing the geometry until I got more and more accurate. This is a ten-fold pattern, and it’s very tricky! I haven’t decided on a colour palette just yet, but I’m going to enjoy a bit of experimentation as soon as I get the chance. I’ll let you know how it goes. And finally… this is what you would see when entering my studio. 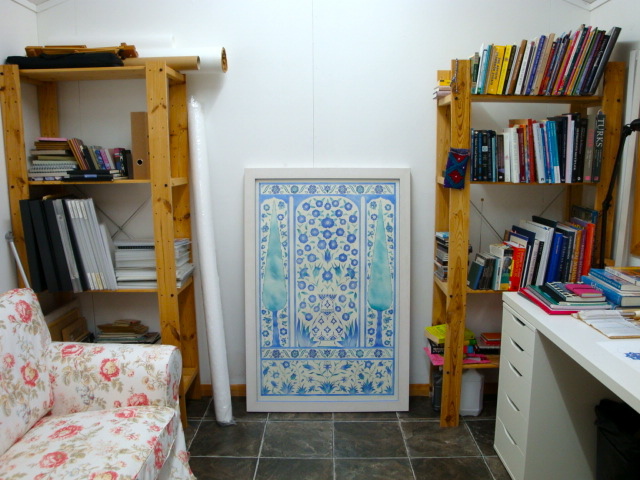 The painting is called “Doorway to Paradise’ and is inspired by a set of ceramic tiles that caught my eye in an Ottoman mosque in Cairo. It’s actually from a “mihrab” (meaning “prayer niche” in Arabic). The “mihrab” is a decorated panel found in the wall of a mosque, which indicates the direction of prayer. 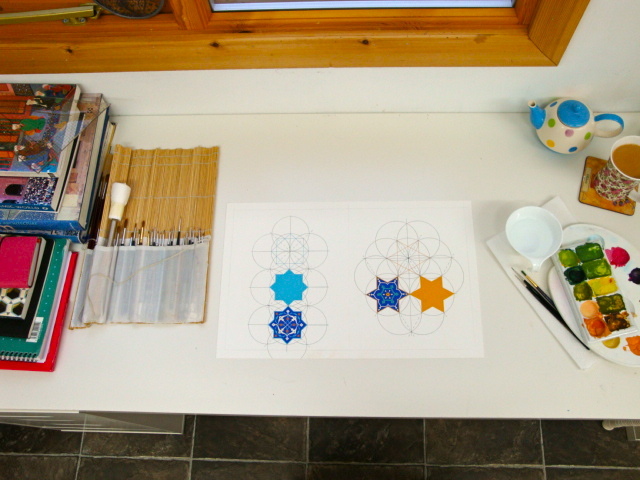 Co-incidentally, the way it is aligned in my studio also indicates the direction of prayer (“qibla”). So when I’m praying in my studio, I pray directly in front of it. It is my hope that the peace from my prayer radiates into the artwork I’m creating, bringing some peace and beauty into the lives of others. It is so interesting to have a sneek view at your working office, and it interests me how one positions their working table in a room, sideways along a window or facing a window, some work in a window-less room . Your table is next to the book shelfs, tells me how precious they are . The kind of chair, the flooring and even the color of the table. where the colours are positioned and the lamp .. Love it! But i was working on a 3D decoupage piece and I needed all of those things lol .. If I take a picture of my desk now it is completly different. Good luck with your Phd! what will it be on? Salaam Dania! Thank you for giving me the idea about this post. You are absolutely right, my books are very precious to me, as are all of my art materials, in fact. Actually, I didn’t think that your workspace was chaotic at all. I remember there was a lot going on, but all of the materials were arranged systematically. It reminded me of my desk, when I have lots of projects on the go – it may look busy to an outsider, but there’s an underlying order to everything which makes perfect sense to the artist. Send me a picture of your work from time to time – I would love to see what you’re doing. Hey Ayesha nice photos of your studio. I love the books and the pretty floral mug (I have a whole collection of them!). I know you’re so passionate about you’re work and it’s reflected in your work space which is pretty well organised I have to say! Brings back wonderful memories! Salaams! salam, im very interested in islamic arts, i intend to go to shah alam- malaysia to take a diploma in mushaf art. i wonder if there is a higher level of studies relating to this course, or what can i do in order to go to a higher stage? thank you. I hope that this helps you. Good luck with the diploma!